The Alfa Romeo GTA is a coupé automobile manufactured by the Italian manufacturer Alfa Romeo from 1965 to 1971. It was made for racing (Corsa) and road use (Stradale). Alfa Romeo GTA in competition. In 1962, the successor for the very popular Giulietta series was introduced. This car was the Alfa Romeo Giulia, internally called the "Series 105". The coupé of the 105 series, used the shortened floorpan from the Giulia Berlina and was designed by Bertone. The name of the car evolved from Giulia Sprint GT to Giulia Sprint and to GTJ (Junior) and GTV (Veloce) in the late 1960s. At the time, Alfa Romeo was very active in motorsport. Autodelta, the racing division of Alfa, developed a car for competition that closely resembled to the roadgoing model. These cars were named GTA instead of GT, the 'A' standing for "Alleggerita", Italian for lightweight. The GTA was produced first in 1965 as a 1.6 L (1,570 cc) and later as a 1300 Junior version. The GTA automobiles were also manufactured in either street (Stradale) or pure race (Corsa) trim. The GTA had aluminium outer body panels instead of steel, (the inner steel panels were also of thinner gauge, the inner and outer panels were bonded and pop-riveted together), magnesium alloy wheels, clear plastic side windows, an aluminium rear upper control arm, different door handles and quarter window mechanisms, and lightweight interior trim. The engine had a new double ignition cylinder head (called twin plug, later in the eighties the system was called twin spark) cylinder head with a Marelli distributor from a Ferrari Dino, 2-barrel 45 mm Weber carburetors instead of 40 mm and magnesium camshaft cover, sump, timing cover and bell housing. The transmission gear ratios were closer than standard and the gears were machined for lightness and quicker shifting. Dry weight of the 1600 was approximately 1,640 pounds (740 kg). In stradale form this car boasted approximately 115 PS (85 kW; 113 hp) (up from 106 PS (78 kW; 105 hp)) and a maximum torque of 142 N⋅m (105 lb⋅ft; 14 kg⋅m) at 3,000 rpm . In full race form this engine could produce up to 170 PS (130 kW; 170 hp). The 1600 GTA did not have a brake booster and had a thicker radiator than the standard vehicle. For homologation 500 cars were made for racing and road use. According to Maurizio Tabucchi (Maurizio Tabucchi is Alfa Romeo book author and consultant at Italian Vintage Automobile Association and at Alfa Romeo Italian Register). The GTA 2000 was a kind of test mule for the GTAm engine. That is the GTAm motor with Lucas injection developing 208 bhp (155 kW) at 6,500 rpm that was fitted to a GTA 1300 Junior chassis. 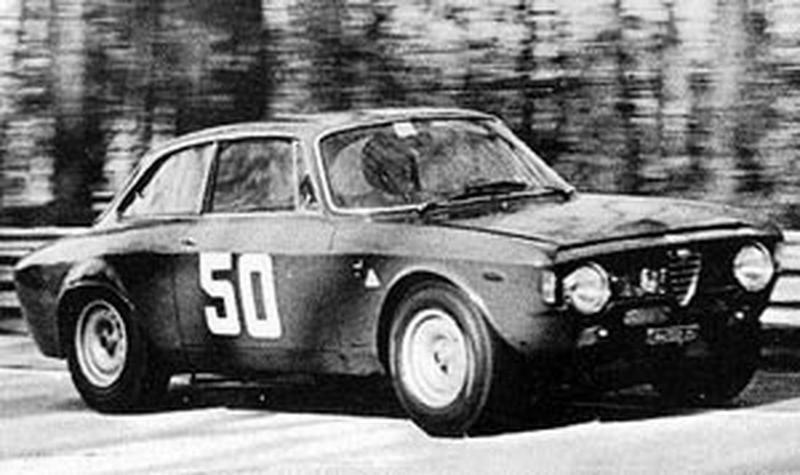 Tabucchi states that the first outing of these car was at the Tour de Corse in 1969 - this took place November 8–9, 1969. Wheels were 14x7 with Michelin PA2 or TA3 tires. Cars were entered by Autodelta and drivers were Pinto/Santonacci who suffered a puncture and suspension breakage at Guitera. The other team was Barayller/Fayel who suffered clutch breakage. Tony Adriaensens also reports GTA 2000 race results, albeit later. There are some doubts whether the Brazilian cars were actually 2000cc, as both Zambello and Fernandez are reported to have won events in 1969 with a GTA1900 which is a different 1,840 cc (1.8 L; 112.3 cu in) engine, though it can not be ruled out that their car was upgraded to 2000cc for 1970. Regardless, given the dates of the events in Brazil, the Angolan and Brazilian cars are different. The GTA 1300 Junior (1968–1975) had a 1300 cc engine that was based on the 1600 engine but with a short stroke crankshaft. The GTA Junior in stradale form did not have many of the light weight features of the 1600 GTA, such as the plastic windows, magnesium engine components and alloy wheels. At the start the engine produced 96 PS (71 kW; 95 hp) but was soon raised to 110 PS (81 kW; 110 hp). Autodelta prepared fuel injected racing cars had 165 PS (121 kW; 163 hp). 450 GTA Juniors were produced. The GTAm (1969–1971) could produce up to 240 PS (180 kW; 240 hp) in the 2000 cc car—a car usually related to the GTA, but unlike the GTA derived from the GTV 1750 (US version). The 1750 GTAm (later called 2000 GTAm when the 2000 GTV was introduced) was created in 1969. There are two schools of thought about the "Am" moniker, neither one ever having been officially confirmed by Alfa Romeo: one expands Am to Alleggerita Maggiorata (Italian: lightened enlarged), the other America Maggiorata. The car had a full steel body modified with aluminium and / or plastic parts. Because of an increased minimum weight in 1971, up from 920 to 940 kg (2,030 to 2,070 lb), the GTAm's had less need for aluminium and / or plastic parts. The base for the GTAm was the 1750 GTV with a SPICA mechanical fuel injection system. The majority of the genuine GTAm's built by Autodelta have a chassis number starting with 105.51.XXXXXX. The European market 1750 GTV with dual carburettors from Dell'Orto or Weber carburetor and chassisnumbers starting with 105.44.XXXXXX was also used as a base. The same goes for the 2000 GTV and the 1300 GT Junior bodyshell that was lighter. Note that some racing teams and private workshops ordered the parts from Autodelta and other tuners and assembled the cars themselves on a new or existing bodyshell. The original 1750 engine block (actually 1779 cc) was used and by inserting a monosleeve instead of four individual cylinderliners, received 1,985 cc (2.0 L; 121.1 cu in) and later to 1,999 cc (2.0 L; 122.0 cu in) to participate in the 2000 cc class, explaining the "maggiorata" (enlarged). According to the sources, some 40 GTAm's were built by Autodelta and by private workshops. This number is difficult to verify as the GTAm's didn't have their own specific chassis number series. In the second revised edition of the book `Alleggerita` (written by Tony Adriaensens & Patrick Dasse), published in 2012 by Dingwort Verlag, you will find the most complete list available of GTAm's. The Giulia 1600 GTA-SA (sovralimentato English: supercharged) (1967–1968) was a very rare racing car, which only 10 were built. Car featured 1570 cc twinspark engine with two oil-driven superchargers and it could produce up to 250 PS (180 kW; 250 hp) at 7,500 rpm. The GTA-SA was built for FlA Group 5 racing in Europe and it won first place overall in the Hockenheim 100 mile endurance race in 1967 in the hands of the German driver Siegfried Dau. In the Netherlands, Rob Slotemaker and Nico Chiotakis also drove GTA-SA. The 1750 GTAm and the 2000 GTAm cars were driven to victory by Toine Hezemans, who won the 24 hours of Francorchamps with this car. These cars won hundreds of races before competition grew stronger in 1971. But the Giulia sometimes kept up with much bigger engined cars such as the 3 litre BMW CSL. In the USA the GTA’s first racing victory was in January 1966 at the “Refrigerator Bowl”, at the now defunct Marlboro Raceway in Maryland, with Monty Winkler and Pete Van der Vate at the wheel. The Autodelta GTA of Horst Kwech and Gaston Andrey won the Under 2 litre class of the inaugural Sports Car Club of America's Trans-Am championship in 1966. Horst Kwech also won the first SCCA National B-Sedan ARRC Championship in the same GTA in 1966. The GTA would also go on to win the 1970 championship. The designation GTA was used in the 2000s for the highest performance road-going versions of the 156 and 147. These cars are powered by 3.2 litre Busso V6 engines giving them the most power of the cars in the model range, however despite the GTA name, they are generally the heaviest cars in the range, due to having large engines and little if any weight saving employed in their construction. For example, the 147 GTA weighs 1,360 kg (2,998 lb). The 147 GTA was introduced in 2002 as the top-end hatchback model for Alfa Romeo. It is powered by a 3.2 litre V6, derived from the 164 from the early 90s. It is a two-door hatchback that seats five, and is characterized by its wider wheel arches, teledial 17 inch wheels, and more aggressive grille design. The 156 GTA was Alfa Romeo's sportiest version of the 156, and used the same 3.2 litre V6 as the 147 GTA, producing 250 PS (184 kW; 247 hp) and 300 N⋅m (220 lb⋅ft) of torque. This four-door saloon was available in sedan or wagon versions. The MiTo GTA prototype has a 1.75 litre, turbocharged straight-4, producing 240 PS (177 kW; 237 hp). However, due to the economic downturn in 2008/2009, the Mito GTA was postponed. ^ "1965 Alfa Romeo Giulia Sprint GTA". automobile-catalog.com. Retrieved 2018-06-09. ^ "About the Author". amazon.com. Retrieved 2012-01-17. ^ "GTA-SA" (PDF). Archived from the original (PDF) on 2012-02-22. Retrieved 2017-07-10. ^ "MHSTC/AvD 100 Meilen von Hockenheim". homepage.mac.com. Archived from the original on 2008-09-15. Retrieved 2009-04-22. Adriaensens, Tony (1994). Alleggerita. Belgium: Corsa Research vzw. ISBN 90-801197-1-7. Adriaensens & Dasse, Tony & Patrick (2012). Alleggerita. Hamburg, Germany: Dingwort Verlag. ISBN 978-3-87166-065-8. Tipler, John (2003). Alfa Romeo Giulia Coupe Gt & Gta. Veloce Publishing. ISBN 1-903706-47-5. Tabucchi, Maurizio (1994). Alfa Romeo GTA. Italy: Giorgio Nada Editore. ISBN 88-7911-132-9. Tabucchi, Maurizio (2009). Alfa Romeo GTA "leggera e vincente". Giorgio Nada Editore, Italy. ISBN 978-88-7911-470-7. D'Amico, Stefano; Tabucchi, Maurizio (2007). Alfa Romeo Production Cars from 1910. Italy: Giunti/Giorgio Nada Editore. ISBN 978-88-7911-408-0. Fusi, Luigi (1978). Alfa Romeo—Tutte le vetture dal 1910—All cars from 1910. Milan: Emmeti Grafica editrice. ASIN B001NF7RUC.